Remember Stanley McChrystal, General Stanley McChrystal? He was commander of U.S. and international forces in Afghanistan and of the Joint Special Operations Command. He oversaw the units that captured Saddam Hussein and tracked down Abu Musab al-Zarqawi. It was news five years ago when he was dismissed as commander of the Afghan war and resigned from the military after an article in Rolling Stone reported disparaging remarks made by him and members of his staff about President Obama and his national security team. Last week, I read about his life since his resignation in a Wall Street Journal article. A West Point graduate and former Green Beret commander, Gen. McChyrstal, now a senior of age 60, is a follower of a fitness lifestyle. According to the WSJ article, he eats one full meal a day and runs an hour every morning, and has done so for the past 30 years. He is co-founder of the McChyrstal Group, a staff of 90 that work with companies to advise them on leadership, management and adaptability. The WSJ article goes on to say people in his management seminars might also take part in physical training competitions and early morning runs around the monuments in Washington, D.C. He's written a book, Team of Teams, that looks interesting on several levels. On the fitness level, maybe there will be more detail about his workout regimen. Does eating “one full meal a day” include any periodic healthful snacks to keep his blood sugar at a steady level? Or is it a daily fast? Do his daily runs include any resistance exercise? I've been asked what I think about some of the well-known high intensity programs? Usually those who ask are looking for a way of pushing themselves but also have concerns about the workouts being age appropriate. If they are what I call “young seniors” and in good health, and they enjoy the challenge, then some forms of high intensity seem reasonable to me. A few subscribers brought up questions about specific programs, some I had never heard of. I don’t make comments about specific programs I haven’t personally tried, so I’m afraid I have to speak in generalities and talk about reasonable guidelines. Some of those guidelines follow. 1. Generally, high-intensity training gets riskier as we get older. So be prudent. Before beginning any fitness training, get clearance from your doctor. 2. All balanced fitness programs should include elements of (a) , strength training, (b) cardiovascular exercise, and (c) flexibility movements. Based on personal preferences and goals, you can put emphasis on either a, b, or c; but totally ignoring any one of them will not provide a balanced fitness program. Some circuit training arrangements can combine all three elements in a single workout, or, of course, they can be split into separate segments. 3. Don’t do marathon workout sessions. Generally, anything over an hour in a gym is too much. Less than an hour is usually even better, provided that it is time actually training, not standing around talking. 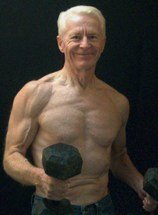 Yes, I know Jack LaLanne is said to have been doing two-hour-plus workouts into his nineties. But are you Jack LaLanne? I’m not. He was one in a million. Keep it real. 4. Cross training can be fun because changes of routine tend to keep things interesting, and overuse injuries are less likely than when doing the same movements over-and-over, month-after-month, year-after-year. 5. Select exercise programs that appeal to you. And there’s certainly nothing wrong with experimenting with different options. Group exercise programs, for example, are perfect for some people and not for others. Whether training in groups or training alone, strength, cardiovascular and flexibility training can be done using only your own bodyweight exercises. On the other hand, why not use free weights, resistance bands or kettlebells if they are available to you? There are lots of options. Last, if you find you dislike what you’re doing, move on and find something you do like. There is a training lifestyle for every taste and to meet every goal. Discover yours and be happy and healthy.